The list is the who’s who of table tennis, name a Swedish hero and a long line of illustrious names will be reeled off the tongue by the local aficionados of the sport; Simon Berglund may not yet be amongst a group that includes the names of Stellan Bengtsson, Jan-Ove Waldner and Jörgen Persson but on the afternoon of Tuesday 14th November, he was the Swedish hero. 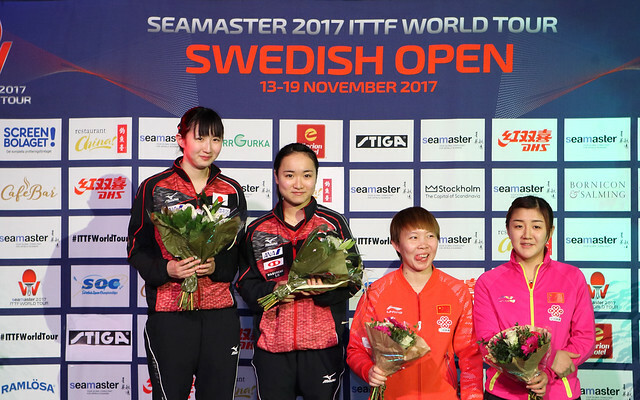 In the Men’s Singles qualification tournament that precedes the Seamaster 2017 ITTF World Tour Swedish Open; in the Eriksdalshallen he delighted the faithful. Presently listed at no.326 on the Men’s World Rankings, he beat Germany’s Ricardo Walther, named at no.43 in arguably the closest contest of the tournament to date; in dramatic fashion he emerged successful by the very minimal two point margin in the deciding game (11-7, 8-11, 11-7, 9-11, 11-6, 9-11, 15-13). A quite outstanding result for a young man, who will celebrate his 20th birthday later this month on Sunday 26th November; prior to play starting for the day, had yet to make his mark on the international scene; that mark has now been made indelibly. Most certainly it was a quite outstanding success against a player who has an ITTF World Tour Men’s Singles title to his name; Ricardo Walther won in Zagreb in 2004. Furthermore, he is in good form; at the recent 2017 ITTF Challenge Belgium Open in early November, he reached the semi-final stage of the Men’s Singles event. Success against Ricardo Walther means that Simon Berglund, the lowest rated player in the group finishes in first place; the previous day he had beaten Austria’s Andreas Levenko (11-3, 11-3, 6-11, 11-9,12-10). Presently on the Men’s World Rankings, Andreas Levenko is named at no.241. A close defeat for Ricardo Walther, for Maharu Yoshimura, the second highest rated player on duty in the Men’s Singles it was a close success; eventually, he overcame (Portugal’s Diogo Carvalho (11-6, 4-11, 11-8, 13-11, 8-11, 7-11, 12-10). Currently Maharu Yoshimura is named at no.33 on the Men’s World Rankings, Diogo Carvalho is at no.286.